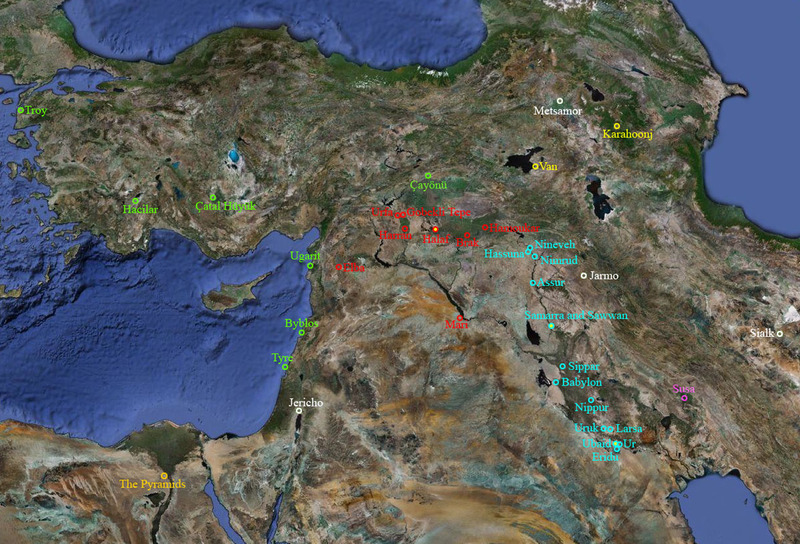 The following satellite images are of the oldest sites that predate those of Sumeria. Although some of these tells are called cities they really are hardly that. They are the first communities, small intimate settlements that for most part have a connection with emerging agriculture but not all. "When the sea level fell dramatically in the sea of Galilee ten years ago  the modern calamity revealed an archaeological treasure: the camp of Stone Age fishermen and hunters, abandoned nearly 20,000 years ago. The calibrated date is 21,500 BC and the site is similar to the Kebaran culture predating the Natufians. Although this is not a pre-city it is the earliest settlement so far known. Grains were found suggesting the earliest attempt at plant harvesting the forerunner to agriculture. Extremely remarkable as it would be about another nine thousand years before the Natufian culture started farming. As you can see it is presently under water. "Radiocarbon dating of the archaeological deposits, some 8 meters in depth, showed that Chogha Golan had been occupied continuously between about 12,000 and 9,700 years ago or even later. Then, Riehl and her colleagues traced the use of plants over that entire period of time. According to their research, the people of Chogha Golan apparently began cultivating wild barley, wheat, and lentils more than 11,500 years ago, and that domesticated forms of wheat appeared about 9,800 years ago, nearly as early as at sites to the west." An important site as it is at present the earliest agricultural site in the Zagros Mountains. What makes it exceptional is that it is pre- Neolithic. It would be later during the Neolithic that more communities/tribes turned to farming in the Zagros. 2015 - Göbekli Tepe as a satellite view no longer displays the stone temples as it is completely covered over by a protective roof. However it is well marked being just northeast of Urfa. The image to the right which is from 2012 shows the structures uncovered. "The earliest settlement was located at the present-day Tell es-Sultan (or Tell Sultan), a couple of kilometers from the current city. Arabic tell means "mound" -- consecutive layers of habitation built up a mound over time, as is common for ancient settlements in the Middle East and Anatolia. The Neolithic settlements were contemporary with Catalhoyuk and had a similar technology level." "The next people who came to Ein es Sultan are called PPNA (The initials stand for Pre-Pottery Neolithic A). They made their settlement at the spring around 8,000 BC. As the name indicates, they had no pottery. (Though as a well-preserved site at Catal Huyuk, Turkey shows they had wooden vessels). The PPNA people built circular dome-shaped one-room huts of curved adobe bricks covered over with plastered mud. Similar circular huts are still built by peasants in northeastern Syria and southeastern Turkey. 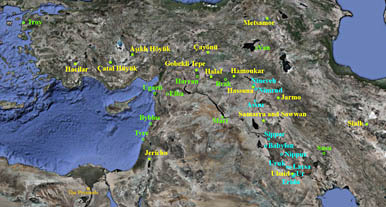 Sites of the PPNA culture are found all over Israel, Jordan, Syria, and northern Iraq and a similar early agricultural village of what was probably a closely related culture is found at Catal Huyuk in south-central Turkey. PPNA is the first agricultural society known. The spread of PPNA probably went along with the spread of a particular language across the Middle East, so PPNA culture was probably spread by one particular people who drove out or absorbed other peoples." 2016 - Jericho was built by the Natufians the first farmers who abandoned it at about 7,000 BC. "The ancient settlement was built around 7500 BC, flourished around 7000 BC, and was inhabited for more than two millennia. It was discovered in the early 1960s by British archaeologist James Mellaart from the University of Istanbul." "From 1961 to 1965, excavations at the site produced a huge number of artifacts and ancient structures including a 10-foot-wide wall painting of the town and two peaks, sometimes referred to as the world’s oldest map." To view map image click here. "The dating of the volcanic rock indicated an eruption about 8,900 years ago [6900 BC], which closely overlaps with the time the wall painting was estimated to have been created. The overlapping timeframes indicate humans in the region may have witnessed this eruption." 2016 - Çatalhöyük is the correct spelling which was modernized by Turkish authorities. Latest satellite image. "Hacilar is an early human settlement in southwestern Turkey, 25 km southwest of present day Burdur. It has been dated back 7040 BC at its earliest stage of development. Archaeological remains indicate that the site was abandoned and reoccupied on more than one occasion in its history." "Hacilar is another important center in Central Anatolia, near the modern city of Burdur. There is evidence there of agriculture dating back 9,000 years. Archaeologists have found considerable amounts of wheat, barley and lentils in the houses at Hacilar, giving clues to people’s diet and the history of domesticated foods. 2015 - The above image which is new may not be the exact location but it is very close. Directions to the site give it only a general area and a clear dig is not discernible. However, it is east of the river, north of the highway and at about the distance it should be west of Hacilar. Also according to the archaeological notes there should be trenches which seem to be evident in this satellite image. As usual there are always discrepancies which in this case is the size of the tell. It is too small but the notes do not say the entire area has been excavated. The size of Tell Hacilar is about 150 yards in diameter (about 137 meters). Another issue is that the tell may have been reburied as it has in the past. "The Çayönü settlement which is not far from the city of Diyarbakir has been unearthed by the expedition teams under the leadership of Cambel, Braidwood, Mehmet Ozdogan, Wulf Schirmen and it is dated back to 7250-6750 BC. In the middle of the settlement is a center and around it are monumental, rectangular structures and houses. The foundation of the structures is stone and above is sun-dried brick. The inhabitants of Çayönü are the first farmers of Anatolia. They raised sheep and goat, and domesticated dog. The woman figurines among the finds discovered are the earliest traces of the Mother Goddess cult." If you try to find this site using Google Maps or Google Earth you will not be directed to the correct location. In fact both of those locations have differing references as to where Çayönü is located which is too far north for both. 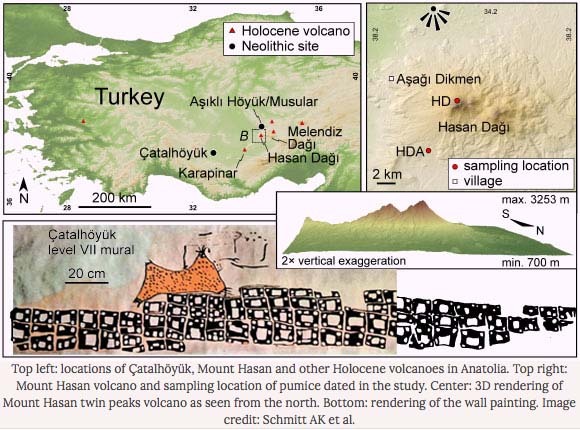 The above map is correct and the actual dig is at the top which has a small stream flowing through it and not at the center which is Sesverenpinar. 2015 - Map to right shows a better image of the site due to improved resolution by Google Maps. "Excavations have shown strata of occupancy going back to the Neolithic period (7,000-5,000 BC), but the most outstanding features of the site were constructed during the early, middle and late Bronze Ages (5,000-2,000 BC). Inscriptions found within the excavation go back as far as the Neolithic period, and a sophisticated pictograph form of writing was developed as early as 2000-1800 BC. The “Metsamor Inscriptions” have a likeness to later scripts. Metallurgy - The excavation has uncovered a large metal industry, including a foundry with 2 kinds of blast furnaces (brick and in-ground). Metal processing at Metsamor was among the most sophisticated of its kind at that time: the foundry extracted and processed high-grade gold, copper, several types of bronze, manganese, zinc, strychnine, mercury and iron." "Jarmo is an archaeological site located in northern Iraq on the foothills of the Zagros Mountains. For a long time it was known as the oldest known agricultural community in the world, dating back to 7000 BC. It is also one of the oldest Neolithic village sites to be excavated. The Jarmo archaeological site was one of the first means of documentation for the way of life of civilization's first farmers and herders. 2016 - Correct image of Jarmo after locating latitude and longitude. "Mehrgarh is a Neolithic (7000-3200 BC) site on the Kachi plain of Balochistan, Pakistan, and one of the earliest sites with evidence of farming (wheat and barley) and herding (cattle, sheep and goats) in south Asia. The site is located on the principal route between what is now Afghanistan and the Indus Valley. A number of terracotta figurines have been found from sites in Mehrgarh dating from the fourth millennium BCE. These represent the earliest forms of female imagery (formerly believed to represent the 'mother goddess') found in the subcontinent (Elgood, p.331). If you go looking for this site you will find it difficult as the Google markers are too far north. This map is correct but even at a higher resolution the detail is not apparent. It could be that this image is too early in the archaeological process or there is not enough detail to see from satellite. It also may have been reburied. 2015 - Map to right shows a better image of the site due to improved resolution by Google Maps. If you visit this site via Google Maps the detail will be apparent. "Archaeologists believe they have uncovered the world's oldest city in a remote part of Syria. Dating back to 6,000BC, the discovery is 2,500 years older than any known site and will prompt a dramatic reappraisal of ancient history. The huge settlement, called Hamoukar, is located between the Tigris and Euphrates rivers, an area known throughout ancient history as northern Mesopotamia. The city spread over 750 acres and is believed to have been home to up to 25,000 people. The discoveries will prompt a re-think of how mankind developed in the "cradle of civilization" between the two great Middle Eastern rivers, the Euphrates and the Tigris. It was here that Babylon and Mesopotamia were established and the oldest known civilization, the Sumerians, were identified to have lived around 3500BC. But Hamoukar is thought to have been constructed between 6000BC and 4000BC. "The Tell Hassuna people had a neolithic culture in northern Mesopotamia. Their culture flourished about 6000-5250 B.C. We do not know what these people called themselves, so Tell Hassuna is a name given as a matter of convenience. They had no form of writing, so we do not know what their language was like. The Tell Hassuna people had a settled lifestyle. Their communities varied in size; the maximum population of their towns was about 500. Most were small villages that covered areas of 2-8 acres. The houses were rectangular and most had more than one room. Mudbrick formed the composition of most of the buildings. Residences typically had yards with walls around them. The residents did much of their cooking in outdoor ovens. However, there were also some indoor ovens with chimneys. Floors were plastered and niches in walls were used for storage. Farming provided much of the food. The Tell Hassuna people raised barley and wheat. They also did a considerable amount of hunting. The game that they hunted included onagers (wild donkeys) and gazelles. It is obvious that they did not domesticate donkeys or horses. Archaeologists have excavated several sites of this culture. Tell Hassuna is the largest community. It had some large central buildings that were divided into small square rooms. These structures had dirt floors and no hearths. The evidence indicates that they were used for storage. An archaeological team found 2,400 clay objects that are thought to have been projectiles propelled by slings. There were also about 100 large balls made of baked clay; these items may have been used as weapons. The inhabitants of the Tell Hassuna towns used stamp seals to make images on clay. They created an enormous amount of pottery. Alabaster and terracotta were commonly used for making pottery. Red paint was used to make linear designs on the pots, bowls, and goblets. Banded designs were common; the stripes were horizontal on some vessels and vertical on others. Many statuettes were created by the Tell Hassuna people. These figurines were often made of alabaster or terracotta. The small sculptures frequently represented female figures. I learned a considerable amount of information about the Tell Hassuna culture during my time as a graduate student at the University of Texas. The Tell Hassuna people were of the stone age, but were quite advanced for that time frame." 2015 - This map shows the correct site. The old image which had been posted for a number of years was not the site. Tell (mound) of Ubaid near Ur in southern Iraq has given its name to the prehistoric culture which represents the earliest settlement on the alluvial plain of south Mesopotamia. The Ubaid culture has a long duration beginning before 5000 BC and lasting until the beginning of the Uruk Period. In the mid 5th millennium BC the Ubaid culture spread into northern Mesopotamia replacing the Halaf Culture. The Ubaid culture is characterized by large village settlements and the appearance of the first temples in Mesopotamia. Equipment includes a buff or greenish coloured pottery decorated with geometric designs in brown or black paint; tools such as sickles were often made of hard fired clay in the south but in the north stone and sometimes metal were used for tools ....."
"In the period 5500–4000 B.C., much of Mesopotamia shared a common culture, called Ubaid after the site where evidence for it was first found. Characterized by a distinctive type of pottery, this culture originated on the flat alluvial plains of southern Mesopotamia (ancient Iraq) around 6200 B.C. Indeed, it was during this period that the first identifiable villages developed in the region, where people farmed the land using irrigation and fished the rivers and sea (Persian Gulf). Thick layers of alluvial silt deposited every spring by the flooding rivers cover many of these sites. Some villages began to develop into towns and became focused on monumental buildings, such as at Eridu and Uruk. The Ubaid culture spread north across Mesopotamia, gradually replacing the Halaf culture. Ubaid pottery is also found to the south, along the west coast of the Persian Gulf, perhaps transported there by fishing expeditions. Baked clay figurines, mainly female, decorated with painted or appliqué ornament and lizardlike heads, have been found at a number of Ubaid sites. Simple clay tokens may have been used for the symbolic representation of commodities, and pendants and stamp seals may have had a similar symbolism, if not function. During this period, the repertory of seal designs expands to include snakes, birds, and animals with humans. There is much continuity between the Ubaid culture and the succeeding Uruk period, when many of the earlier traditions were elaborated, particularly in architecture. Left: Stamp seal with animal and bird, 6th–5th millennium B.C. ; Ubaid period Syria or Anatolia. The impressing of carved stones into clay to seal containers had a long tradition in Mesopotamia, with the earliest evidence found in Syria dating to the seventh millennium B.C. During the Ubaid period, the variety of designs carved on seals expanded from simple geometric forms to include animals with humans, snakes, and birds. Seals like this one with deeply carved animal motifs became characteristic of northern Syria and southeastern Anatolia. It is decorated with a four-legged horned animal. Above the animal is a leaf shape, possibly a stylized bird, while two bent lines under its body may represent vegetation or perhaps snakes." "During the 6th and 5th millennium BC the peoples of Ubaid Mesopotamia and the Arabian Neolithic met and interacted. This was first realised during the 1960's and 1970's, when numerous sites were identified in the Central Gulf region which contained pottery in the Ubaid style. These were mostly coastal, and were mainly found in the northeastern province of Saudi Arabia, though sites were also identified in Bahrain and Qatar. The majority were small and ephemeral, but a handful were large, with deep deposits and abundant pottery. Abdullah Masry studied these sites (Masry 1974), and excavated three of the most promising ones (Abu Khamis, Dosariyah and Ain Qannas). Excavations also occurred at smaller Ubaid sites in Bahrain and Qatar (Roaf 1976; de Cardi 1978). Masry concluded that this part of Arabia had enjoyed a close and integral relationship with Southern Mesopotamia. More controversially, he suggested that the Mesopotamian and Ubaid-related Arabian sites should be regarded as part of the same social and economic system, and that the origins of Mesopotamian civilization lie as much in the Arabian Peninsula as in Mesopotamia. Meanwhile, Joan Oates and her collaborators proved through petrographic and compositional analysis that the Ubaid-style painted pottery from the Gulf states originated in Southern Mesopotamia (Oates et al. 1977). She had a simpler explanation than Masry, suggesting that Ubaid visitors travelled down the Gulf in search of fish and perhaps pearls, trading their pottery with local communities along the way." "Samarra is now one of the largest archaeological sites in the world." "Archaeologists have found five levels of occupation at Tell es-Sawwan. The first two are designated as I and II; they are generally thought to be of the Tell Hassuna culture. These levels have a tripartite building plan. These tripartite buildings were made around a central room. It was divided into three parts and a corridor bordered it on each side. The areas were further subdivided into chambers. Some children's graves have been discovered in the floors. A number of goods were found with the remains of the children. These burial items consisted of pottery and figurines made of alabaster. Radiocarbon dating was made from a floor sample of level I; it was dated to 5506+73 B.C. A similar date (also taken from a floor) was given for Level II. In Level III the architecture has a different pattern. Level IIIA has T-shaped buildings with fortification features. These include walls, ramparts, and ditches. In Level IIIB the buildings are converted into granaries. The radiocarbon dating was made from a floor and is 5349+86 B.C. This level is dated to the Samarra period. [Note - The Samarra time frame is 5500-500 B.C.] I should mention that not all of the pottery of Level III is Samarra; some of it is Hassuna. Levels IV and V are also dated to the Samarra. A major change is apparent in Level IV. The fortifications are no longer used. Level V has been dated to the Halaf period." "Tell as-Sawwan was fortified early today in Iraq, 110 km northwest of Badgadista fairly close to Samarraa. Place is located in northern and central Mesopotamia frontier rain-growing border, south of. This early settlement was the central Mesopotamia, the Tigris river, archaeologists running of perhaps about 6300-6100 BC , Whose inhabitants lived kasteluviljelyllä and store grain. Clay utensils and copper machining, cold, perhaps you know. Miniature judging palvottiin men and women on fertility liiittyen so later than the Middle East and elsewhere. Tel es-Sawwanin village joined the broader Samarran culture, which is considered to be the Middle East sivilisaatiokehityksen pre-operational phase. sawwan located in the cultural area of the southern border." Eridu was located by the mound called Abu Shayhrayan. This was one of the most important prehistoric urban centers in southern Babylonia. It was built on sand dunes probably in the fifth millennium B.C. It completely showed the sequence of the preliterate Ubaid civilization. 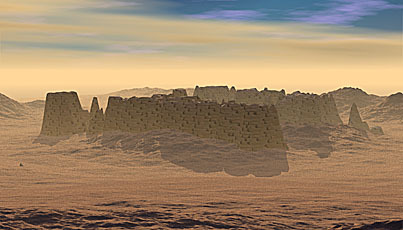 Eridu had a long succession of super imposed temples portraying the growth and development of intricate mud brick architecture (Britannica, 1999). The apparent continuity of occupation and religious observance at Eridu provide convincing evidence for the indigenous origin of Sumerian civilization [emphasis added]. The site was excavated between 1946 and 1949 by the Iraq Antiquities Department (McDonald) The city continued to be occupied until 600 B.C. but was less important in historic periods." Eridu is, according to the Sumerians, their first city after the flood. In the King List they document five earlier cities and claim them as their own. 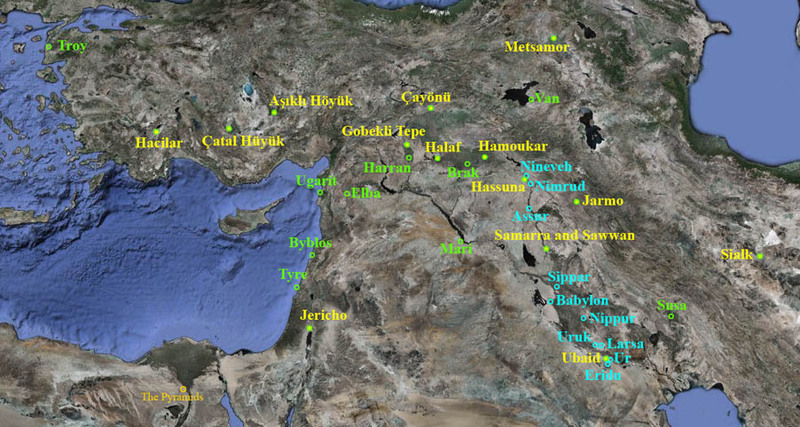 Archaeologists, however, would consider these earlier cities as Ubaidian. I consider the cities before the flood and those that came after as Sumerian. As far as I am concerned the Ubaidians are the preflood Sumerians. See page First Legend Introduction for more info. Pre-Sumerian cities in Yellow except for Mehrgarh which is off the map to the east.